I am so excited to be sharing this with you today. 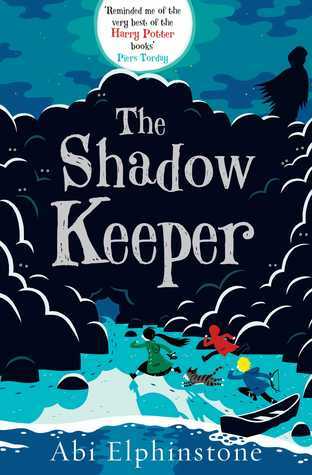 Abi Elphinstone publishes the second book in her Dreamsnatcher series, The Shadow Keeper on the 25th of February and the whole of the blogosphere can't wait to read it! Abi's first book was a huge success and I'm positive this one will be just as popular. Abi has kindly allowed us to share with you the first part of the prologue from The Shadow Keeper. I've read it and it is fabulous. I hope you enjoy it too. or women brave, and none on a night as dark as this. snakeskin mask of the figure in the boat. magic towards the opening in the cliff face. Wow! I definitely need to read more of this book! How about you? How would you like to win both books in the series? Just leave a comment for Abi below, along with your email address to be in with a chance of winning Dreamsnatcher and The Shadow Keeper. The competition will run until the 13th of February and is open to UK & Eire residents only. Only one entry per person please. The winner will receive the books directly from the publisher. I need this more than air!! The Dreamsnatcher is one of the best children's books ever, and I NEED to read the Shadow Hunter so much!!! Now that I've read the prologue I'm even more desperate. Pretty please with sprinkles!! Words that roll off the tongue, to be read aloud, and the hint of a dark adventure to be read in torchlight under duvet. Well done, Abi. Oooh, I wanted these two. Disappointed.I live in Italy! These will be great to read to my eldest son, he was upset when we finished the Harry Potter books and would be good to get into another series with him. My son Maelor has already read Dreamsnatcher (loved it) and interviewed Abi last year. We don't need both books (I'm sure we'll be buying Shadow Keeper!) but just wanted to add our recommendation for anyone on the fence! If you don't enjoy them, you can catapult me! And the winner is Sophie. Congratulations an email is on its way to you.